You might have noticed a change in the way people are paying at stores lately. Instead of swiping or dipping credit cards, they’re holding their mobile device over the POS terminal. This type of payment, called a “contactless” or NFC payment, uses near field communication to transmit information from a mobile device to a payments reader. In addition to EMV chip cards, NFC mobile payments are part of our charge toward more secure, authenticated ways to pay. As opposed to magstripe cards (which are prone to fraud), NFC payments have multiple layers of security involved in the transaction, designed to protect bank details. NFC mobile payments are also the fastest way to pay. The transaction time is super fast, unlike credit card transactions, which can take several seconds (chip cards, in fact, are noticeably sluggish). Most major retailers are accepting both Android and Apple Pay. 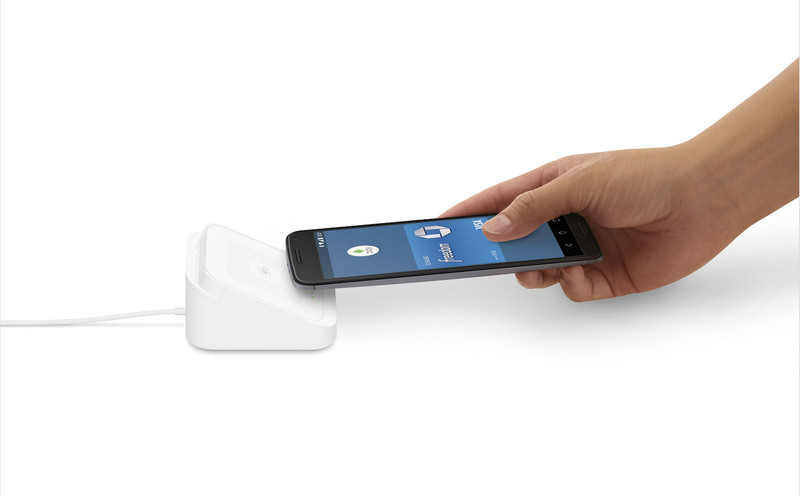 But now any business of any size can accept Android Pay with Square’s new contactless and chip reader (which retails for $49). Accept Android Pay and chip cards everywhere. Android Pay is compatible with most newer versions of Android phones. The Square contactless and chip reader works with most Android devices, as long as you’re running Google Android 4.0 or later, have location services enabled, and have access to Google Play. You can check to see which devices the Square contactless and chip reader supports here. If you’d like to get set up to pay via Android Pay, first find the app on your phone. If it didn’t come preloaded, just download it from Google Play. Next, you can add the card associated with your Google account by confirming a few details. You can also add a new card by snapping a picture. Finally, unlock your phone and tap to get going. To start accepting Android Pay at your store, you can order the Square contactless and chip reader. It works directly with your Android device, so setup is simple. Learn more about how to start accepting NFC contactless payments. You can use your Bank of America, Citi, PNC, TD Bank, and Wells Fargo accounts with Android Pay, and a number of others. The Android Pay website has a full list of banks that accept the payment method. To pay with Android Pay, just open the app on your phone (which requires you to have a secure lock screen) and complete the transaction by holding (or tapping) your device over the payments reader. The transaction is completed in just a few seconds. Mobile wallet payments like Android Pay are much more secure than magnetic-stripe cards, and they’re also more convenient. Instead of carrying a physical wallet, you just need your smartphone. As opposed to EMV, or chip card, transactions, which tend to lag, contactless payments take just a few seconds to process. Once you make a purchase, a payment confirmation appears on your phone noting where the transaction occurred, plus the merchant’s name and number. This makes it easy to catch any fraudulent charges. And in cases of loss or theft, you can lock your device with Android Device Manager, which also allows you to change the password and delete your personal information. Apple Pay is Apple’s mobile payment app, meaning it won’t work on Android devices. You need an iPhone 6 (or Plus), an iPhone 6S (or Plus), or an Apple Watch to use Apple Pay. Both Apple Pay and Android Pay use NFC (near field communication) technology to process transactions. To pay for something via Android Pay or Apple Pay, you hover (or “tap”) your phone above the NFC-enabled payments reader while your finger is on the home button (the “Touch ID” button in the case of Apple Pay) The payment is then triggered automatically. You can use both Android Pay and Apple Pay to make online payments within apps. Samsung Pay works on newer versions of Samsung Galaxy devices. Samsung Pay also works on NFC contactless readers. As opposed to Android Pay and Apple Pay, to trigger an NFC contactless payment with Samsung Pay, you swipe up from the home screen. At this point, you can’t use Samsung Pay to make online payments within apps.